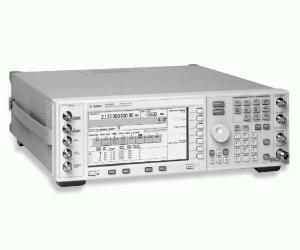 Selecting Option 501 for the E4438C ESG vector signal generator provides a 250 kHz to 1 GHz frequency range. Five frequency range options are available to choose from, extending from 1 GHz up to 6 GHz maximum carrier frequency. This provides ample resolution to configure the ESG to meet your specific test requirements. Option 501 is recommended for test cases that require baseband and RF test signals at or below 1 GHz carrier frequency. Common uses include test stimulus generation for various components used in wireless communications systems transceivers, such as ASICs, DSPs, ADCs, DACs, up/down converters, filters and power amplifiers. In addition, the 1 GHz frequency range enables the generation of receiver test signals at low-band cellular frequencies, including GSM.